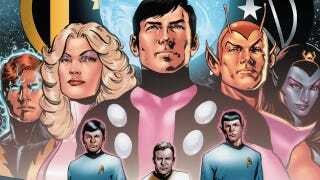 At New York Comic Con, io9 had the opportunity to catch up with comic book writer Chris Roberson, who's helming the upcoming Star Trek/Legion of Super-Heroes miniseries. Roberson gave us the scoop on both this intergalactic mash-up and his new project Memorial, which he described as "Doctor Who meets Sandman meets Hayao Miyazaki." How did you get onboard with Star Trek/Legion of Super-Heroes? When they contacted me, I thought it was a prank because it is an idea that is at once ridiculous and awesome. They asked me if I had any sort of affinity for those two franchises. When I was about nine, there was nothing more that mattered to me than Legion and Star Trek. It was definitely in my wheelhouse! How much freedom did you have to play in those two universes? I had pretty much carte blanche. I don't think they balked at anything I wanted to do. The only stipulation on me was that it would be the original Star Trek cast, but even there, it was my suggestion to do the television era rather than film, and they had no problem with that. I wanted to use the Paul Levitz/Keith Giffen era of Legion and they were fine with that. I could do whatever I want, it was great. What sort of storyline are you tinkering with? The basic idea is that six Legionnaires are in a time bubble and six members of the Enterprise crew are beaming down to Earth. While they're in transit — in the transporter beam and in limbo — reality gets quickly unwritten. They're deposited in a new universe that blends the two. Basically, the conceit is that the Star Trek and Legion worlds had a shared historical point that they diverge from. Someone has messed things up so that neither of the histories have come into being. It's not that they've been transported to a parallel world, but their world has been replaced by this. They have to figure when and where things were changed. What Legion/Trek team-ups were particularly fun to write? The obvious one is Braniac 5 and Spock, because they're both green-blooded scientists from worlds whose cultures are devoted to logic. Any chance of salt vampires versus Parademons? That is a good question! There are a lot of mash-ups. It's a mix of taking Star Trek and Legion concepts and merging them. There are some pretty strange ones. Another one of your ongoing projects is iZOMBIE for Vertigo. What's in store for zombie detective Gwen in upcoming arcs? So the last arc had the much abused horror population of Eugene, Oregon having to deal with a zombie invasion. Now they're dealing with the after-effects of that. The real trouble is that a giant Lovecraftian monster from beyond the space and time shows up. Hilarity ensues! A lot of Vertigo series tend to put a cap on how long they run. How far have you outlined iZOMBIE? I very much use Bill Willingham's approach on Fables, which is that rather than having an end point to a series I have an end point for the various storylines. There are overarching storylines from the first issue. That will wrap up probably around issue 36 or so. What can you tell us about your new project for IDW Publishing, Memorial? The bumper sticker pitch is "Doctor Who meets Sandman meets Hayao Miyazaki." The series opens with a young woman who arrives at the hospital with no ID or memory of who she is or what happened to her. She's diagnosed of having suffered a dissociative fugue, a psychological condition where great trauma causes them to wipe out who they are. She spends a year rebuilding her life: getting a job and an apartment and making new friends. She's basically looking for things that might trigger her memory, so she walks around the city looking for things that might remind her. One day she walks down a street she's seen hundreds of times before, but she sees a door she's never noticed. It leads to a weird antique shop. Through this adventure, she ends becoming the owner of the shop, but when she walks outside again, the shop is a different place. It's the kind of place where you'd buy a gremlin or a monkey paw. The only access she has to what's going on is a talking cat that's been hiding out in the store for a while. We'll be releasing it like Locke and Key, through a series of miniseries. Star Trek/Legion will be out October 19, iZOMBIE is ongoing, and Memorial hits stores December 28.